Austin Scott Miller (born May 15, 1961) is a United States Army general who currently serves as the commander of NATO's Resolute Support Mission and U.S. Forces - Afghanistan. He previously served as the commander of Joint Special Operations Command from March 30, 2016 to August 2018. He has participated in numerous combat operations, such as; Battle of Mogadishu 1993, and since 2001 the wars in Iraq and Afghanistan. He assumed his current assignment on September 2, 2018. On 18 October 2018, within days before the Afghan parliamentary election over the weekend, Miller was unhurt after a shooting in Kandahar Palace, but an Afghan general and Kandahar police chief Abdul Raziq Achakzai was assassinated by the designed conspiracy against General Abdul Raziq. Born in Honolulu, Hawaii on May 15, 1961, Miller graduated from the U.S. Military Academy in 1983, and commissioned as an infantry officer. After completing Ranger School, he was assigned a platoon in 3rd Battalion, 325th Infantry (Airborne), 82nd Airborne Division. Afterwards Miller was a platoon leader with A Company, 2nd Battalion (Ranger), 75th Ranger Regiment from January 1986 to May 1987. Miller completed Infantry Officer Advanced Course in June 1989 and was assigned to South Korea as a Company Commander with 5th Battalion, 20th Infantry (Mechanized), 2nd Infantry Division, Eighth United States Army. Later he was an instructor at the Special Operations Division School of the Americas at Fort Benning Georgia. In 1992, Miller completed the Delta selection course and was assigned to 1st Special Forces Operational Detachment – Delta (1st SFOD-D), or Delta Force at Fort Bragg, North Carolina, where he held numerous leadership positions including Squadron Operations Officer, Troop Commander, Selection & Training Commander, A Squadron Commander, as well as Deputy Commander and Commanding Officer from 2005 to 2007. Miller participated in numerous combat operations during Operation Gothic Serpent in Somalia, Operation Joint Endeavor in Bosnia, Operation Enduring Freedom in Afghanistan and Operation Iraqi Freedom. 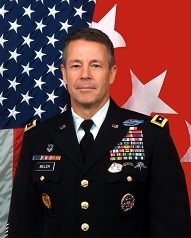 In October 1993, Miller was the ground force commander during the Battle of Mogadishu whilst Lieutenant Colonel Gary L. Harrell held operational command of C Squadron, 1st SFOD-D.
From 2008 to 2009, Miller was assigned Deputy Director for Special Operations, J-37, The Joint Staff, Washington, D.C. From September 2011 through August 2012, he was Special Assistant to the Director of the Joint Improvised Explosive Device Defeat Organization in Arlington Virginia. He later was Special Assistant to the Deputy commanding general, United States Special Operations Command in Washington D.C. from August 2012 through June 2013. From June 2013 to June 2014, Miller was commanding general of the Combined Forces Special Operations Component Command in Afghanistan, or CFSOCC-A, responsible for employment and coordination of special operations forces and assets to achieve NATO and US military objectives. In Summer 2014, Miller became commanding general of the United States Army Maneuver Center of Excellence at Fort Benning. Since 2016, he is the commanding general of the Joint Special Operations Command. He is a graduate of the United States Army Command and General Staff College, the United States Marine Corps War College, and the Joint and Combined Warfighting School. On October 18, 2018, he was in the room when a Taliban gunman in a governor's compound in southern Kandahar shot Abdul Raziq, but he was not harmed. Miller drew his sidearm during the shooting, waited until the wounded were attended, and flew out with the casualties afterward, which included Brig. Gen. Jeffrey Smiley. ^ "Leadership in the Current Operating Environment: JSOC Commander Lt. Gen. Austin Miller - Modern War Institute". Retrieved October 22, 2018. ^ "Miller Takes Over NATO, U.S. Commands in Afghanistan". Defense.gov. September 2, 2018. Retrieved September 3, 2018. ^ "Key Afghan Police Chief Dies in Kandahar Shooting; Top U.S. General Escapes Uninjured". Retrieved October 22, 2018. ^ "Register of Graduates and Former Cadets, United States Military Academy". October 22, 1989. Retrieved October 22, 2018 – via Google Books. ^ "New Benning commander named to succeed Maj. Gen. H.R. McMaster". Retrieved October 22, 2018. ^ "This Army general is likely to lead the shadowy Joint Special Operations Command". Washington Post. Retrieved October 22, 2018. ^ Salahuddin, Sayed; Constable, Pamela (October 18, 2018). "U.S. commander in Afghanistan survives deadly attack at governor's compound that kills top Afghan police general". The Washington Post. ^ CNN, Ryan Browne,. "US brigadier general wounded Thursday in Afghanistan attack". Retrieved October 22, 2018.